As a native and lifelong Seattle resident, I’ve seen a few new city parks open, and I’ve usually gotten around to visiting them within several months or a year of their openings. 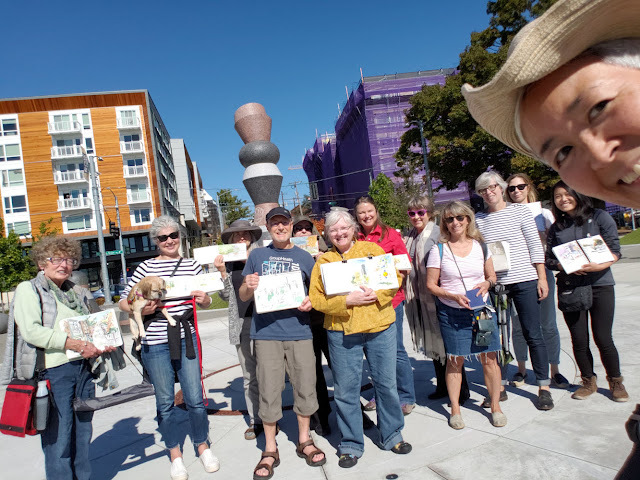 Thanks to Urban Sketchers, today I saw a brand-new park that just opened last month – Yesler Terrace Park – much sooner than I probably would have otherwise. Formerly the site of the Yesler Terrace public housing development, the 1.7 acre park serves “as a gathering place for current and future residents of Yesler Terrace as well as people who live and work in the surrounding community. The current residents are primarily from Southeast Asia and the Horn of Africa.” A new housing development for a range of income levels was built nearby. Having seen only a few photos of the park in the newspaper, I didn’t really know what to expect when I arrived. It’s a wide-open, welcoming space with lots of benches, tables and small sculptures. Looking right past the freeway, there’s a spectacular view of south downtown, the stadium and even a peek at the peak of Mt. Rainier. (And somehow I forgot to take photos of any of it!) If you walk through the park and down multiple stairways, you pass newly landscaped and terraced grounds and eventually end up in the middle of Chinatown-International District. If you are looking for one of Seattle’s most diverse neighborhoods, Yesler Terrace Park would be at its center. With all of that to choose from, what did I sketch? 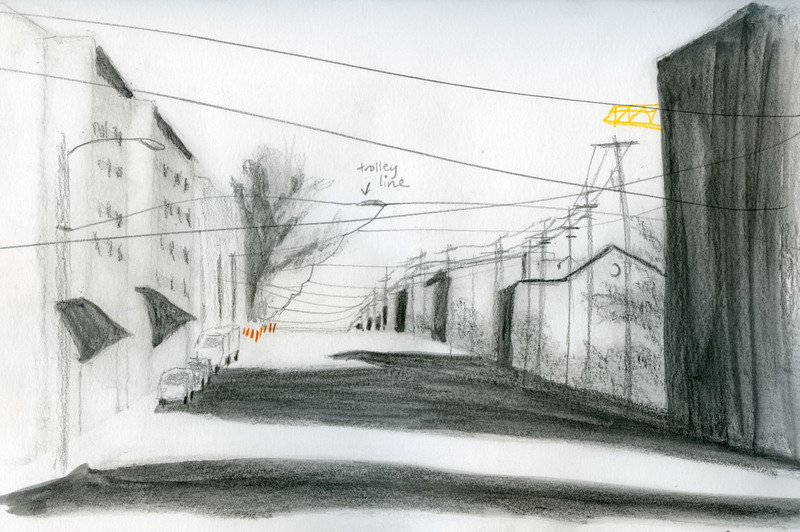 Streetcar and utility wires criss-crossing Broadway and shadows in the street cast by new construction. As seems to have become my habit lately, I spent so much time on that first sketch that I left myself only 26 minutes before the throwdown for a second sketch. Looking for the Smith Tower, my favorite Seattle building, I had to sight past one of numerous concrete spheres around the park. 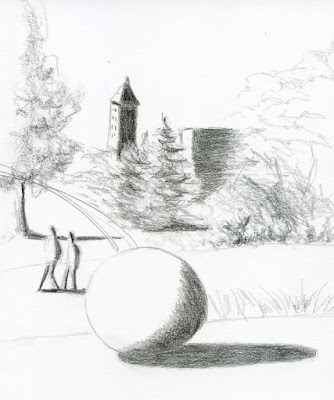 It reminded me of one of the early exercises we did in the drawing class I took last month: sketching a ball in the sunlight to practice capturing the core shadow, cast shadow, form shading and reflected light. The whole scene looked like a value study, so study it I did. This time we had a rain contingency plan that consisted of more than optimism, but luckily, we didn’t need it. The morning turned out sunny, warm and beautiful – a lovely gift for the end of September.